Add the onion and rosemary, sauté until onion becomes translucent. Add carrot, cook on medium heat in skillet, covered, until tender, about 5 minutes. Add asparagus, cover and cook another 2-3 minutes until it is tender, yet slightly crispy. 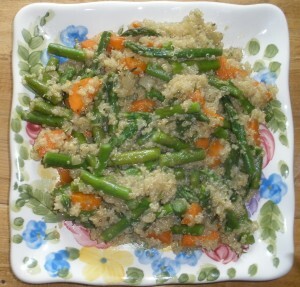 When quinoa is done, toss it lightly into the vegetables in the skillet, using a fork to fluff it. Stir in the freshly chopped savory. This recipe calms and helps Vata, Pitta and Kapha constitutions.